Missy (and all of you): If you upgrade to yosemite I recommend a clean install. You are a mind reader! I was going to ask you about your opinion on Yosemite. What do you mean by a clean install? I have just started The Dragon's Trap Normal to see if it opens after the save. with Mavericks? Perhaps Vern should be notified? Maybe he will know the answer to this problem. 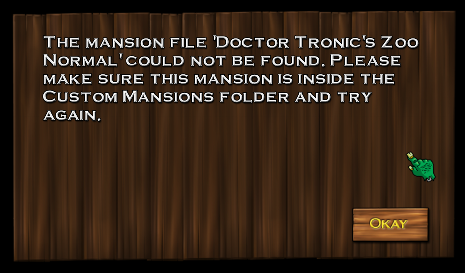 to the ActionSoft/MM folder and then I clicked on Saved Mansions and tried to open both games from there. No dice! So I double clicked on Dr. T's title and this is the pop up I got from that ActionSoft section, see below pic. What does that mean "Document Format"? I thought that after the zip file was open, the actual game appeared, not a document format. Any ideas, anyone? The below pic & instructions are from the ActionSoft website instruction. Nor does he show where the MM HD 1&2 is stored when downloaded. Are those instructions for Mac Versions less than 10.9? NOTE: Somewhere in Vern's instructions he says something about MM HD not recognizing sub-folders and Brell, you too said something about that. So I messed around some more, while trying to follow Vern's instructions. After several tries, I finally figured it out. Att: Mavericks users. 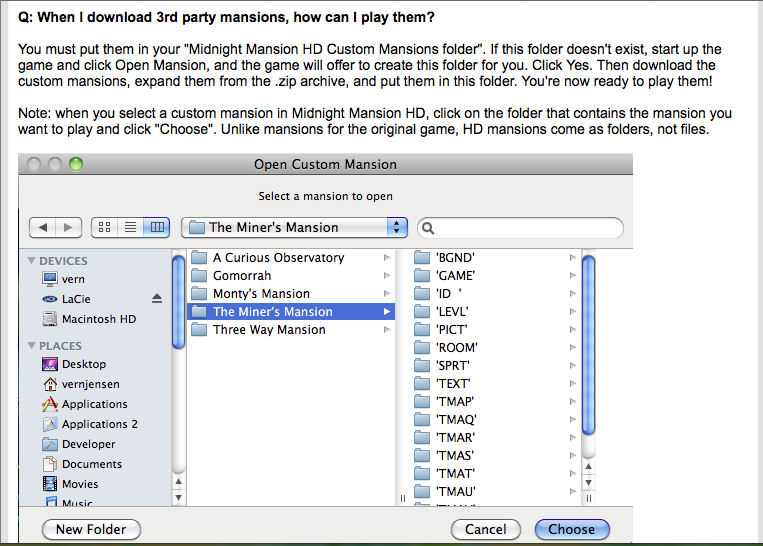 MM HD 1&2 game & the Custom Mansions Folder will be downloaded to your "Download Folder". JUST LEAVE THEM THERE, DO NOT RELOCATED THEM! 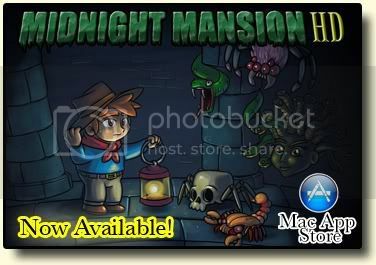 - Download the Custom Mansion game of your choice. The zip file will go into your Download Folder. Open the zip file from there (OR from the shortcut in the upper right corner of your Safari window, to the right of Reader) and a brand new (name of the CM game) folder will appear above the zip file, in the Downloads Folder. - CLICK ON THAT NEW FOLDER and to the right of that section, in the sub-section, a brand new zip file will appear along with a ReadMe file. DOUBLE CLICK ON THAT NEW ZIP FILE and a new (name of the CM game) folder will appear right above it again. CLICK ON THAT NEW FOLDER and to the right of it, in the sub-section, you will see the game data that belongs to it. DO NOT DRAG ANYTHING ELSE INTO THE CM FOLDER!!! Now your saved games will play! TaDa!! version. If they just checked their revisions before releasing them to the public, they wouldn't have to always come out with a newer version to correct their previous mistakes and then the newer version screws everything up. It's a vicious circle. your Download Folder and if you ever want to clean it out as I do, you will have a mess on your hands bcos it's hard to keep track of all the active games from other games sites as well. i am having the same prob, when i land up in room 15896, i hv 1 yellow key short, i hv taken the key hidden in the very right side of mansion... i hv searched the map, i dont know where m i missing it .. ! ohhhh yes ...found it ..